One of the best small growing trees for the landscape in the Hudson Valley Region. Beauty and elegance all wrapped up in a tree that is tough rugged and more importantly deer resistant. There are many varieties but all provide for an excellent specimen for your garden. 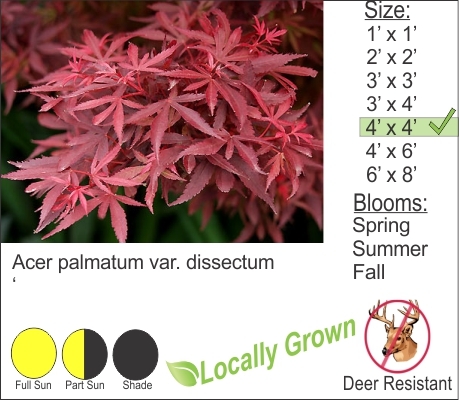 Cut leaf weeping Japanese maples are considered small growing trees and can range in size from 6ft. to 15ft. depending on the cultivar. There leaves also have different color ranges some are vibrant green, maroon, blood red. All of these Japanese Maples have a brilliant autumn color.